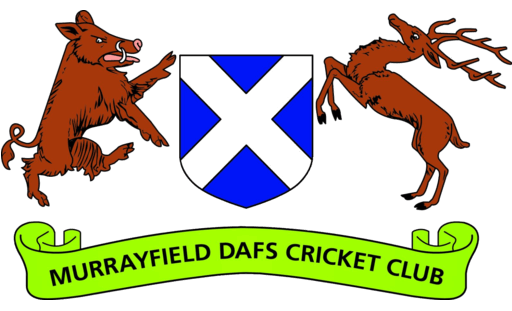 MDAFS III 118-1 (S Tahir 90*) beat Edinburgh South II 116-9 (S Perry 2 for 11, N Pujari 2 for 12, A Bharadwaj 2 for 14, J Gutteridge 2 for 15) by 9 wickets. The 3s returned to Roseburn looking to right the wrongs of last week’s chastening defeat at Stewart’s Melville. The opposition this week were Edinburgh South 2s who had started the season slowly so hopes were high for a return to winning ways, however we knew they had several dangerous batsmen in their line-up. In what is fast becoming a routine occurrence, James won the toss (75% success rate, other skippers take notes) and elected to bowl first, hoping to get the game over before the forecast rain prevented a result. Simon and James opened proceedings with Simon bowling an excellent line and length at no mean pace and James trying to draw attacking shots from South’s excellent young opener Barratt. While Barratt was scoring relatively quickly, his opening partner was struggling to get Simon away and this brought an early wicket with Nidhish taking an excellent steepling catch at midwicket to give Simon his first MDAFS wicket. The South batsmen were looking a bit too settled facing two right arm seam bowlers at this point so James elected to remove himself from the attack and bring on Lindsay for his first spell of the season. What followed was a masterclass in the value of persistence and accuracy as Lindsay (6-0-17-1) drew their number 3 into a false shot, with Nidhish again taking a great catch at midwicket. Not long after, Simon (8-2-11-2) produced an absolute jaffa of a delivery to remove Barratt who had begun to look very dangerous with Neil taking a smart catch behind the stumps. The end of Simon’s spell saw Nidhish (5-0-12-2) introduced to the attack and he bowled impressively once he had settled into a nice line and length, snagging two wickets including a magnificent reflex caught & bowled. Abhilash, in his first league game this season, replaced Lindsay from the other end and, despite struggling initially, produced two absolute gems to clean bowl their number 4 and give Nidhish his 4th catch of the innings. James reintroduced himself to the attack and bowled a much improved second spell, grabbing a couple of quick wickets courtesy of two excellent catches from Abhilash and Simon respectively. Meanwhile, Archie was bowling some absolutely unplayable leg spin from the other end, on a day that was ready-made for seam bowling, and was unlucky on several occasions not to take a wicket. Graeme, on his league debut, was introduced alongside Chris for the final few overs and bowled some deceptively sharp stuff to limit the scoring as the opposition 10 and 11 looked to hit out at the death. An excellent bowling and fielding performance (with special credit to the pint-sized panther Nidhish) limited South to 116-9 off their 40 overs and the 3s looked well set to record a well-earned comeback victory. After a tea which drew many admiring comments from the opposition (“curry pies and strawberry tarts, can’t beat it”), Stephen and Saad walked out to face the opening salvo. Stephen produced a customarily battling innings, not once shying away from a barrage of short-pitched bowling, and was unlucky to depart in the 7th over for possibly the most hard-earned 4 anyone will see this season. Saad meanwhile had decided that he wasn’t waiting around for the game to be rained off and set about the bowling with aplomb. Several good length balls were dispatched to the boundary, while anything short was mercilessly smashed and, with excellent support from Lindsay (18*), Saad raced to a massive 90* (including five sixes) inside 20 overs to take us over the line with 9 wickets to spare. The headline performance was undoubtedly Saad’s superlative batting display, onlookers might have wondered when Chris Gayle signed up for MDAFS 3s (Enquiries to his agent discovered that he doesn’t like curry pies and thus our interest was dropped), however this was truly a team performance. Every single player fielded like their life depended on it, with Archie covering more ground at square leg than the average marathon runner, and it showed in the bowling figures the kind of confidence this instilled in the bowlers. Again, a special mention for Nidhish for a ludicrous 4 catches and 2 wickets. Thanks also to Ian and Edinburgh South 2s for a game played in great spirits. Latest Junior News – Festivals, Fridays and Fixtures!